2 HPV Konszenzus Konferencia, 2006. Október 20. 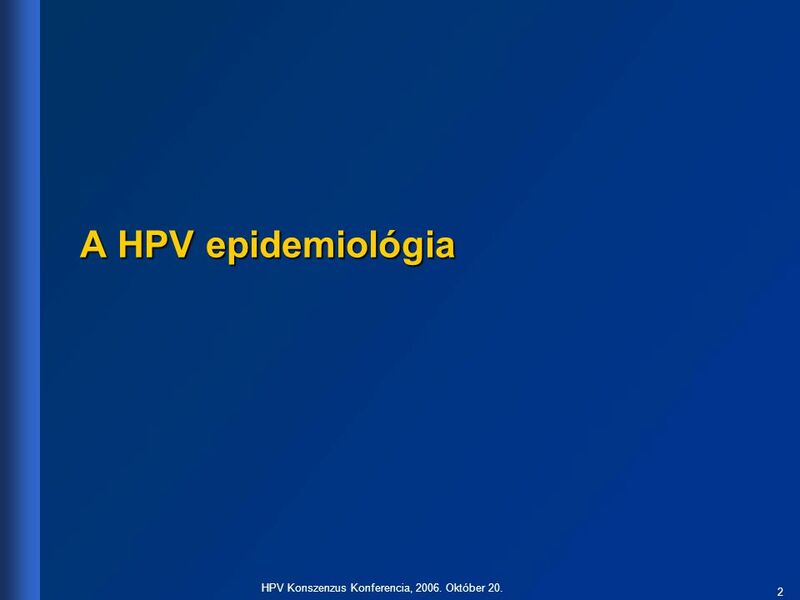 A HPV epidemiológia HPV Konszenzus Konferencia, Október 20. 3 HPV Konszenzus Konferencia, 2006. Október 20. 6 HPV Konszenzus Konferencia, 2006. Október 20. Összegzés Az adatok arra utalnak: HPV infekció kockázata jelentős. Új fertőzés kockázata az életkor előrehaladásával csökken. Az infekciók leggyakrabban nem onkogén típussal jönnek létre. Az újonnan fertőzöttek jelentős hányada onkogén, kisebb hányada16-os típussal fertőződik. HPV Konszenzus Konferencia, Október 20. 7 HPV Konszenzus Konferencia, 2006. Október 20. 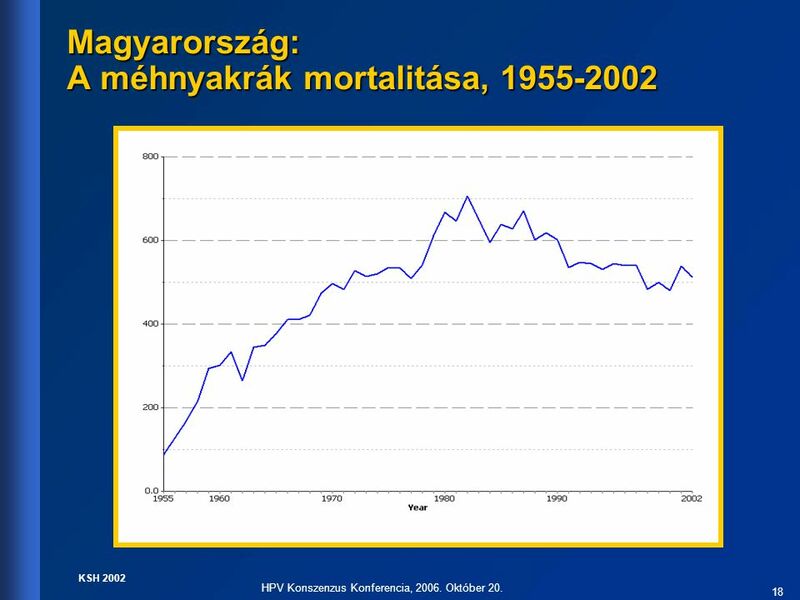 HPV és méhnyakrák HPV Konszenzus Konferencia, Október 20. 69.7 14.6 1/Munoz/p. 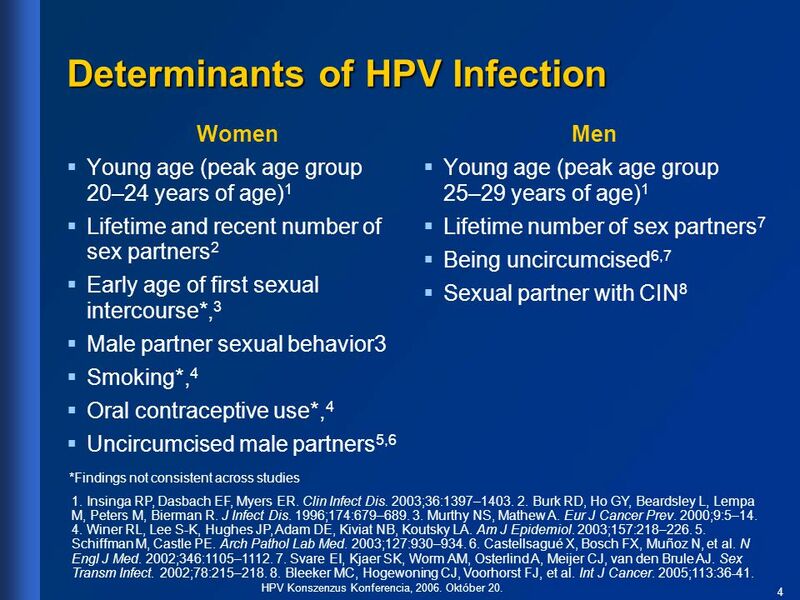 282/Table III HPV Type 16 52.5 25.7 18 45 67.6 17 31 North America/ Europe 33 57 12.6 52 South Asia 58 Key Point Most cases of invasive cervical cancer are associated with HPV 16 or 18, but approximately one quarter to one third of all cases are associated with other HPV types, the distribution of which varies by region. Background In a pooled analysis from an international survey of HPV types in cervical cancer and from a multicenter, case-control study (N = 3607), both co-coordinated by the International Agency for Research on Cancer (IARC) and with HPV DNA detection and polymerase chain reaction (PCR) done centrally, Muñoz and colleagues investigated geographic variations in the contribution made by different HPV types to invasive cervical cancer.1 HPV DNA was detected in 96% of specimens from women with incident, histologically confirmed cervical cancer. Thirty different HPV types were identified. The 15 most common types (in descending order of frequency) were 16, 18, 45, 31, 33, 52, 58, 35, 59, 56, 39, 51, 73, 68, and 66.1 Reference 1. Muñoz N, Bosch FX, Castellsagué X, et al. Against which human papillomavirus types shall we vaccinate and screen? The international perspective. Int J Cancer. 2004;111:278–285. Others Northern Africa 1/Munoz/p. 278/abstract. Central/South America *A pooled analysis and multicenter case control study (N = 3607) 1. Muñoz N, Bosch FX, Castellsagué X, et al. Int J Cancer. 2004;111:278–285. 1/Munoz/p. 278/abstract. HPV Konszenzus Konferencia, Október 20. Infection with oncogenic HPV types is the most significant risk factor in cervical cancer etiology.1 HPV is a main cause of cervical cancer.2 Analysis of 932 specimens from women in 22 countries indicated prevalence of HPV DNA in cervical cancers worldwide = 99.7%.2 Tissue samples were analyzed for HPV DNA by 3 different polymerase chain reaction (PCR)–based assays, and the presence of malignant cells was confirmed in adjacent tissue sections.2 1/Muñoz/ p. 519/col 1/¶1. 2/Walboomers/p. 12/title; abstract. 2/Walboomers/ p. 12/abstract; col 1 /¶1; col 2/ ¶2; p. 13 /col 2 /¶7; p. 18/col 1 /¶1. 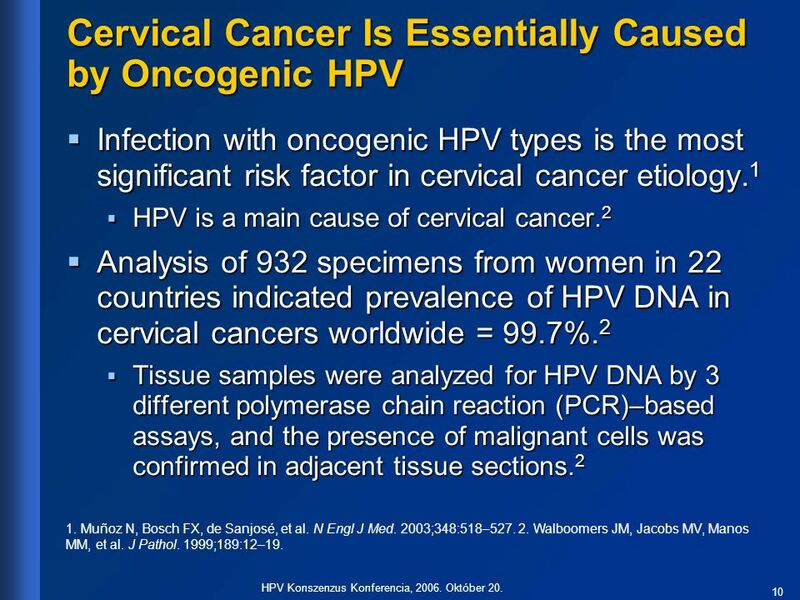 Key Point Oncogenic HPV types are the core cause of cervical cancer. Background In a meta-analysis, specific oncogenic HPV types have been identified in 63%–97% of invasive cervical cancer cases worldwide.1 Among 85 studies measuring HPV prevalence in invasive cervical cancer by polymerase chain reaction (PCR)–based assays (N=10,058), HPV 16 was the predominant type in squamous cell carcinoma cases (46%–63%), followed by HPV 18 (10%–14%), 45 (2%–8%), 31 (2%–7%), and 33 (3%–5%), except in Asia, where HPV 58 and 52 were found in 6% and 4% of cases, respectively. In adenocarcinoma and adenosquamous-carcinoma cases, HPV 18 was predominant (37%–41%), followed by type 16 (26%–36%) and type 45 (5%–7%). The overall detection of HPV DNA in invasive cervical cancer was similar in different regions worldwide.1 Due to sample inadequacy or integration events effecting the HPV L1 gene, the target of the PCR-based assay, some projected prevalences may actually be underestimated. Walboomers and colleagues conducted a study to more accurately assess the prevalence of HPV DNA.2 A PCR-based test was used; however, in HPV-negative cases, the biopsy was reanalyzed by a sandwich procedure, in which the inner sections of a series of tissue sections were assayed by 3 different HPV PCR assays targeting different open reading frames, while the outer sections were reviewed to verify the presence of malignant cells. Analysis of 932 specimens from women with cervical cancer in 22 countries indicated that worldwide HPV prevalence in cervical carcinomas is 99.7%.2 References 1. Clifford GM, Smith JS, Plummer M, Muñoz N, Franceschi S. Human papillomavirus types in invasive cervical cancer worldwide: A meta-analysis. Br J Cancer. 2003;88:63–73. 2. Walboomers JM, Jacobs MV, Manos MM, et al. 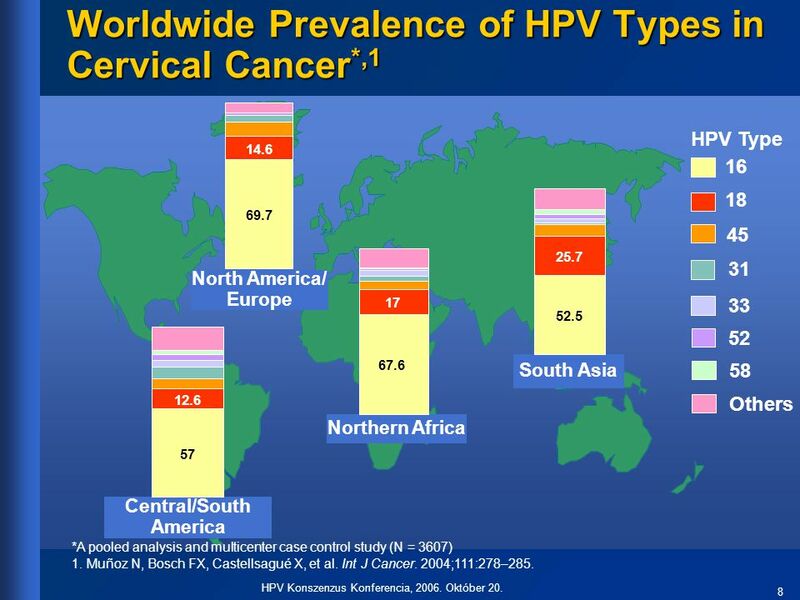 Human papillomavirus is a necessary cause of invasive cervical cancer worldwide. J Pathol. 1999;189:12–19. 1/Clifford/p. 63/abstract/ calculation 1. Muñoz N, Bosch FX, de Sanjosé, et al. N Engl J Med. 2003;348:518– Walboomers JM, Jacobs MV, Manos MM, et al. J Pathol. 1999;189:12–19. 2/Walboomers/p. 12/ abstract/ col 1 /¶1; col 2/¶2; p. 13/col 2 /¶7; p. 18/col 1 /¶1. HPV Konszenzus Konferencia, Október 20. 11 HPV Konszenzus Konferencia, 2006. Október 20. Összegzés Feltételezhető, hogy: A méhnyak rák kialakulásában a legfontosabb faktor az onkogén HPV. A méhnyak rák esetek 75-85%-ának kialakulásában a HPV 16 és 18 típusnak szerepe van. Lényeges eltérést ebben a vonatkozásban az egyes földrészek lakossága nem mutat. HPV Konszenzus Konferencia, Október 20. HPV Konszenzus Konferencia, Október 20. 1/WHO/p. 40/ ¶3,4. 1/WHO/p. 40/ ¶3,4. 2/Ferlay/GLOBOCAN/ Report 1/p. 4 Morbidity Global prevalence: ~2.3 million1 Global incidence: ~500,0001,2 Globally, cervical cancer is second to breast cancer as the leading cause of cancer in women.2 2nd leading female cancer in women less than 45 years of age in developed countries2 Mortality 3rd most common cause of overall female cancer-related mortality worldwide2 Burden Estimated individual loss of life = 25.9 years in the United States (2002)3 In comparison, women who die of breast cancer or ovarian cancer lose an estimated 19.0 and 17.4 years of life, respectively.3 2/Ferlay/GLOBOCAN /Table 1/p. 3 2/Ferlay/GLOBOCAN /Table 10 2/Ferlay/GLOBOCAN /Table 11 3/Ries/Figure I-19. 1/FerlayGLOBOCAN /Table 1/p. 3 Key Point Globally, cervical cancer is the second leading cause of cancer in women. Background Globally, cervical cancer is second to breast cancer as the leading cause of cancer in women,1 with a global prevalence of 2.3 million.2 It accounts for nearly 10% of all cancers (excluding non-melanoma skin cancers).3 In developed countries, cervical cancer is the second leading female cancer in women less than 45 years of age.1 In the absence of screening programs, cervical cancer is detected too late and leads to death in almost all cases. Cervical cancer is the third most common cause of female cancer-related mortality worldwide.1 According to data from the SEER Cancer Statistics Review (1975–2002), women who die from cervical cancer in the United States lose 25.9 years of life on average (2002). In comparison, women who die from breast cancer lose an average of 19.0 years of life, and women who die from ovarian cancer lose an average of 17.4 years of life (2002).4 References 1. Ferlay J, Bray F, Pisani P, Parkin DM. GLOBOCAN 2002: Cancer incidence, mortality and prevalence worldwide, version 2.0. IARC CancerBase No. 5. Lyon, France: IARC Press; 2004. 2. World Health Organization. State of the art of new vaccines research and development: Initiative for vaccine research. Geneva, Switzerland: World Health Organization; 2003:1–74. 3. Franco EL, Harper DM. 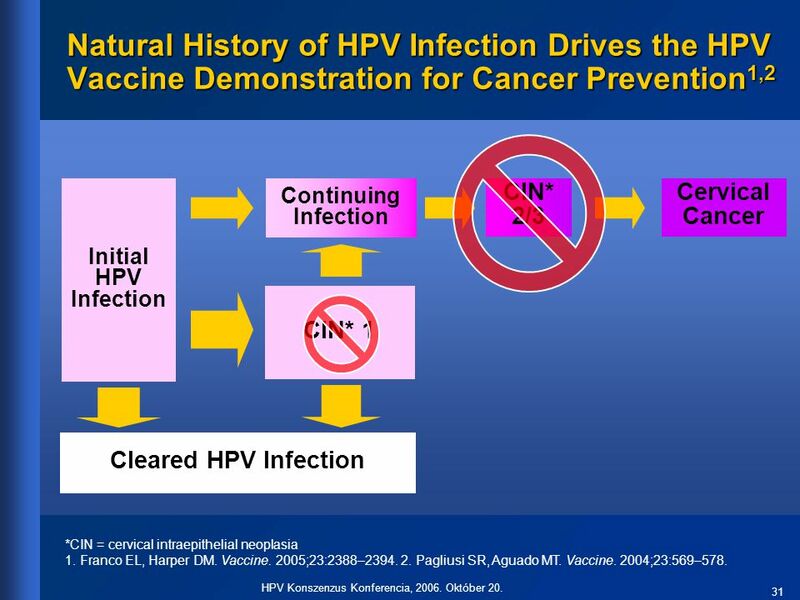 Vaccination against human papillomavirus infection: A new paradigm in cervical cancer control. Vaccine. 2005;23:2388–2394. 4. Ries LAG, Eisner MP, Kosary CL, et al. (eds). SEER Cancer Statistics Review, 1975–2002, National Cancer Institute. Bethesda, MD, Based on November 2004 SEER data submission; posted to the SEER Web site 2005. 2/WHO/p. 40/ ¶4. 3/Franco/p. 2389/col 1/¶4. 1/FerlayGLOBOCAN /Table 10 1/Ferlay/GLOBOCAN/Table 11 1. World Health Organization. Geneva, Switzerland: World Health Organization; 2003:1– Ferlay J, Bray F, Pisani P, Parkin DM. Lyon, France: IARC Press; Ries LAG, Eisner MP, Kosary CL, et al. (eds). SEER Cancer Statistics Review, 1975–2002, National Cancer Institute. Bethesda, MD; 2005. 4/Ries/ Figure I-19 HPV Konszenzus Konferencia, Október 20. 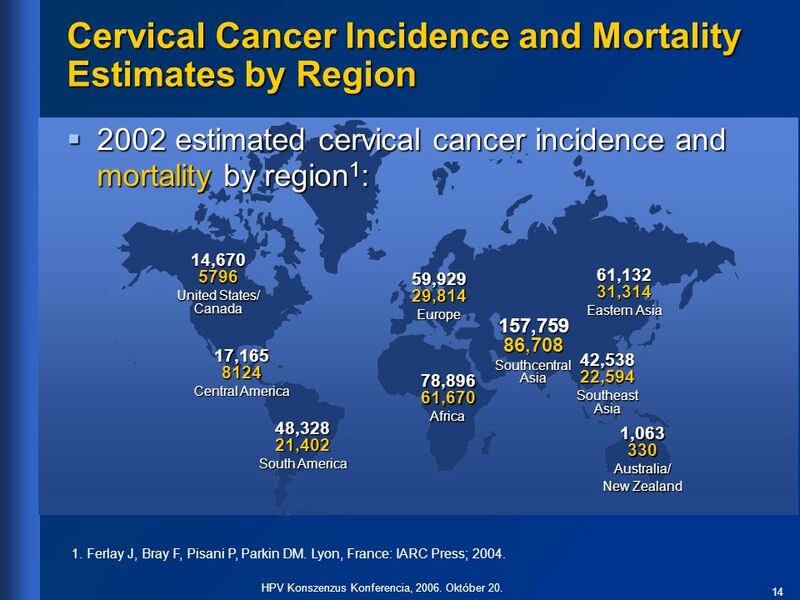 2002 estimated cervical cancer incidence and mortality by region1: 1/GLOBOCAN /Cervix Uteri Table /col 1; col 4: (US/Can)p.3/ (CentAmer)p. 2/ (S.Amer)p.2/ (Europe)p. 4/ (Africa)p. 1/ (Aust/New Z) p. 5/ (Asia)p. 3. 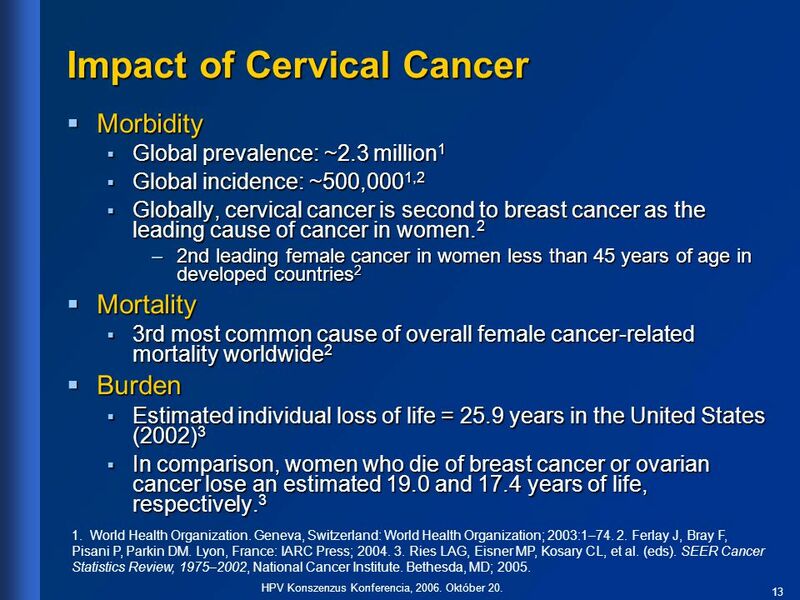 14, United States/ Canada 59,929 29,814 Europe 61,132 31,314 Eastern Asia 157,759 86,708 Southcentral Asia 17, Central America 42,538 22,594 Southeast Asia Key Point Worldwide cervical cancer rates are high, particularly in developing countries, and are still unacceptable in developed countries. Background According to data obtained from GLOBOCAN 2002, 82% of new cervical cancer cases occur in developing countries.1 As stated by WHO, “without screening programs (i.e., routine pap smears), cervical cancer is detected too late and leads to death in almost all cases.”2 However, even in Europe, the United States, or Canada, where most women have access to routine screening, approximately 30,000 women die each year.1 References Ferlay J, Bray F, Pisani P, Parkin DM. GLOBOCAN 2002: Cancer incidence, mortality and prevalence worldwide, version 2.0. IARC CancerBase No. 5. Lyon, France: IARC Press; 2004. World Health Organization. State of the art of new vaccines research and development: Initiative for vaccine research. Geneva, Switzerland: World Health Organization; 2003: 1–74. 78,896 61,670 Africa 1/GLOBO-CAN/World–Females Table/p.1/col 8; Cervix Uteri Table/p. 1/col 1; col 4. Table/p.3-4/col 4; Calculation Table/p.5. 48,328 21,402 South America 1, Australia/ New Zealand 1. Ferlay J, Bray F, Pisani P, Parkin DM. Lyon, France: IARC Press; 2004. 2/WHO/p.40/¶3 HPV Konszenzus Konferencia, Október 20. 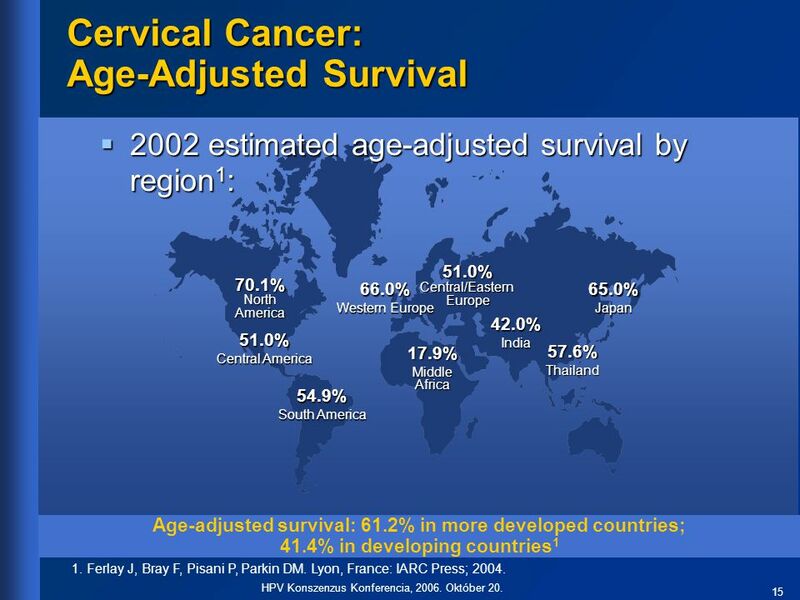 2002 estimated age-adjusted survival by region1: 1/GLOBOCAN /Cervix Uteri Table /p. 1-5; calculations /p. 1. 51.0% Central/Eastern Europe 70.1% North America 66.0% Western Europe 65.0% Japan 1/GLOBOCAN /Age-adjusted Survival Table. 42.0% India 51.0% Central America 17.9% Middle Africa 57.6% Thailand Key Point Overall, age-adjusted survival rates are considerably lower in less developed regions than in developed regions. Background Data from GLOBOCAN 2002* indicate that age-adjusted survival rates are relatively high in more developed areas in the world, such as the United States, Canada, Western Europe, and Japan. In these regions, age-adjusted survival is 65%–~70%. Overall, the age-adjusted survival rate is 61.2% in more developed countries, compared with 41.4% in developing countries, although Thailand and some countries in Central and South America (such as Belize, Argentina, and Uruguay) have higher survival rates than some countries in Eastern Europe (such as Romania and the Russian Federation).1 However, in less developed regions, such as Middle Africa, age-adjusted survival rates can be as low as 17.9%. Reduced survival rates in these regions are likely due to inadequate screening practices.2 Without screening programs (i.e., routine Pap smears), cervical cancer is detected too late and leads to death in almost all cases.3 *GLOBOCAN 2002 is a project that aims to present estimates of the incidence and prevalence of and mortality from 27 cancers for all the countries in the world in 2002. References 1. Ferlay J, Bray F, Pisani P, Parkin DM. GLOBOCAN 2002: Cancer incidence, mortality and prevalence worldwide, version 2.0. IARC CancerBase No. 5. Lyon, France: IARC Press; 2004. 2. Sankaranarayanan R, Budukh AM, Rajkumar R. Effective screening programs for cervical cancer in low- and middle-income developing countries. Bull World Health Org. 2001;79:954–962. 3. World Health Organization. State of the art of new vaccines: Research and development: Initiative for vaccine research. Geneva, Switzerland: World Health Organization; 2003:1–74. 54.9% South America 1/GLOBOCAN /Cervix Uteri Table /p. 1-5; calculations/p. 1; age-standardized rate survival table Age-adjusted survival: 61.2% in more developed countries; 41.4% in developing countries1 2/Sankaranarayanan /p. 40 /abstract. 3/WHO/p. 40/¶4. 1. Ferlay J, Bray F, Pisani P, Parkin DM. Lyon, France: IARC Press; 2004. HPV Konszenzus Konferencia, Október 20. 16 HPV Konszenzus Konferencia, 2006. Október 20. Kelet-Európa: Nők daganatos halálozási adatai Kelet Európában a méhnyak rák a 3. vezető halálok. HPV Konszenzus Konferencia, Október 20. 17 HPV Konszenzus Konferencia, 2006. Október 20. 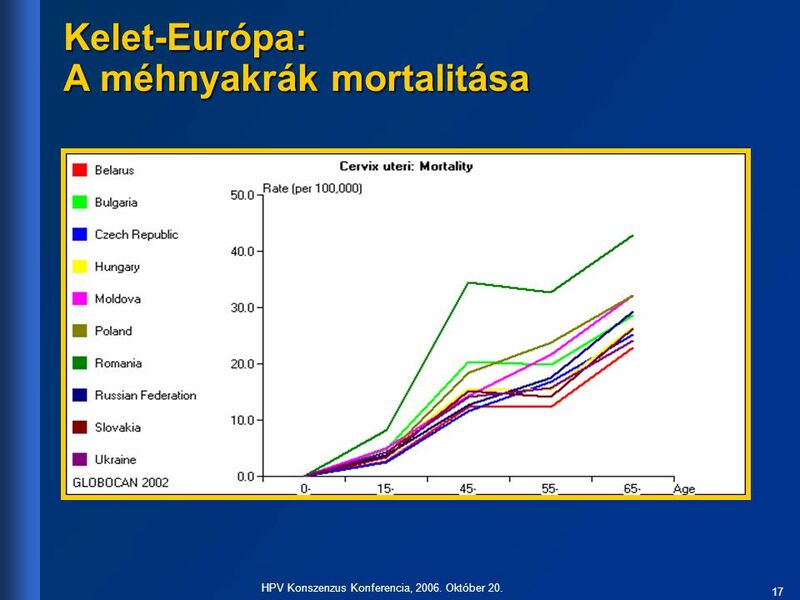 Kelet-Európa: A méhnyakrák mortalitása HPV Konszenzus Konferencia, Október 20. KSH 2002 HPV Konszenzus Konferencia, Október 20. 1/GLOBOCAN/ Table 5,6 Key Point Whereas cervical cancer is more prevalent in women 45–54 years of age in the developing world, it is a disease of either elderly or young women in the developed world. Background Data from the GLOBOCAN 2002* database demonstrate that the incidence of new cervical cancer cases is considerably higher in developing countries compared with the incidence in developed countries. In less developed regions, the number of new cases per year is 409,269, compared with 83,437 in more developed regions. The age-standardized rate is 19.1 cases per 100,000 individuals in less developed regions and 10.3 cases per 100,000 individuals in more developed regions. 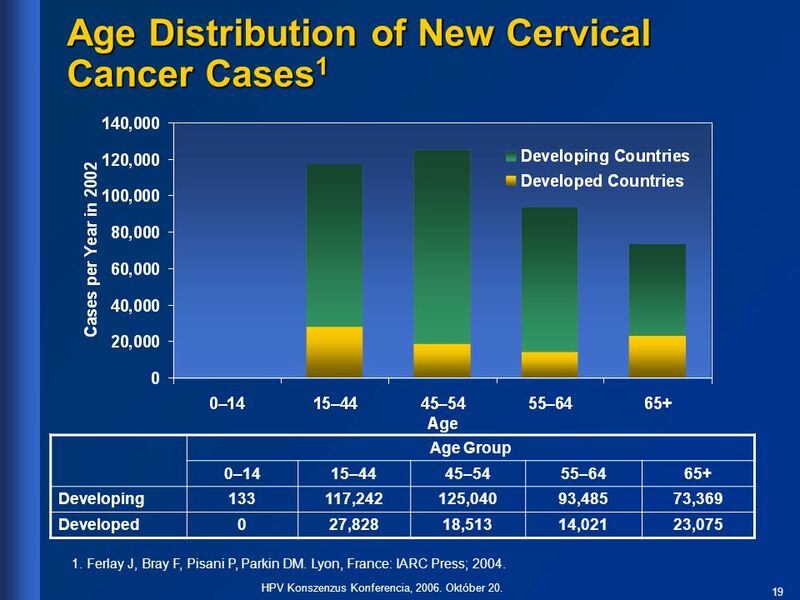 Interestingly, the ratio of new cervical cancer cases in developed to developing countries is lowest in women >65 years of age.1 Prevalence is higher in young and older populations in the developed world, as screening may be less effective in these age groups.2 *GLOBOCAN 2002 is a project that aims to present estimates of the incidence and prevalence of and mortality from 27 cancers for all the countries in the world in 2002. References 1. Ferlay J, Bray F, Pisani P, Parkin DM. GLOBOCAN 2002: Cancer incidence, mortality and prevalence worldwide, version 2.0. IARC CancerBase No. 5. Lyon, France: IARC Press; 2004. 2. Quinn M, Babb P, Jones J, Allen E. Effect of screening on incidence of and mortality from cancer of cervix in England: Evaluation based on routinely collected statistics. BMJ. 1999;318:904–908. Age Group 0–14 15–44 45–54 55–64 65+ Developing 133 117,242 125,040 93,485 73,369 Developed 27,828 18,513 14,021 23,075 1/GLOBO-CAN/ Table 2,3 2/Quinn/ p. 906/col 1/¶2; p. 907/col 2/¶3 1. Ferlay J, Bray F, Pisani P, Parkin DM. Lyon, France: IARC Press; 2004. HPV Konszenzus Konferencia, Október 20. 20 HPV Konszenzus Konferencia, 2006. Október 20. Összegzés A méhnyak rák Magyarországon (Kelet-közép Európában) a fiatal nők második leggyakoribb rosszindulatú daganata harmadik leggyakoribb halálok. Átlagosan 30 évvel rövidíti meg a betegek várható élettartamát. Az elmúlt évtizedekben a szűrési erőfeszítések ellenére gyakorisága hazánkban lényegesen nem csökkent HPV Konszenzus Konferencia, Október 20. 23 HPV Konszenzus Konferencia, 2006. Október 20. 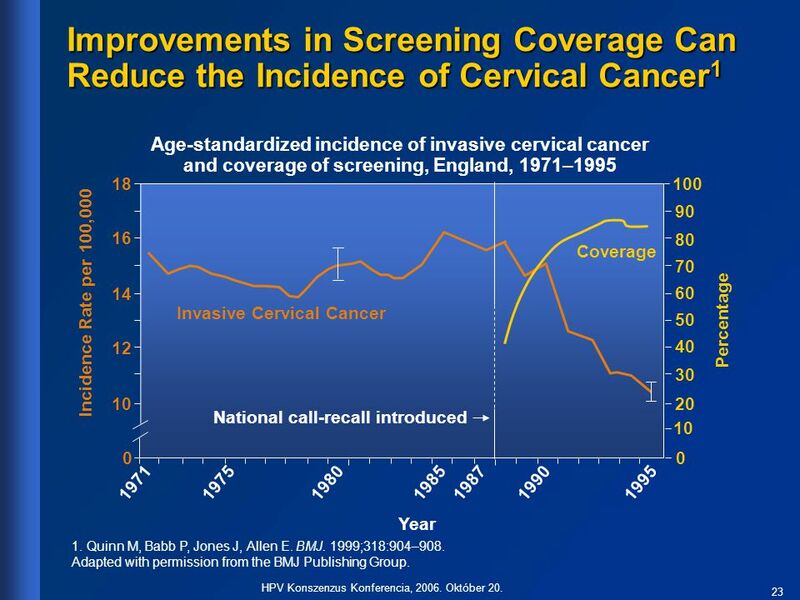 Improvements in Screening Coverage Can Reduce the Incidence of Cervical Cancer1 Age-standardized incidence of invasive cervical cancer and coverage of screening, England, 1971–1995 18 100 1/Quinn/p. 905 /Figure 3. 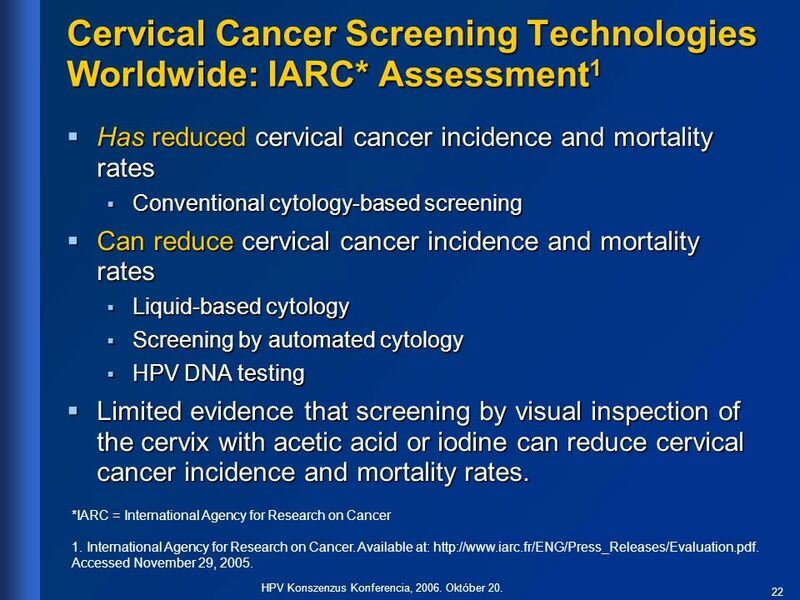 90 16 80 Coverage 70 14 60 Incidence Rate per 100,000 Invasive Cervical Cancer Percentage 50 12 40 30 Key Point Improvements in screening can lead to a decrease in incidence of invasive cervical cancer. Background Quinn and colleagues1 assessed the impact of screening on cervical cancer incidence and mortality in women >19 years of age in England. The overall incidence of invasive cervical cancer remained stable from 1971 to the mid-1980s (3,900 cases/year on average), when the cervical cancer screening program in England was largely ineffective because of problems with how it was organized. Upon instituting improvements in the screening program, including the introduction of the national call and recall system and incentive payments to general practitioners, screening coverage increased to around 85%. 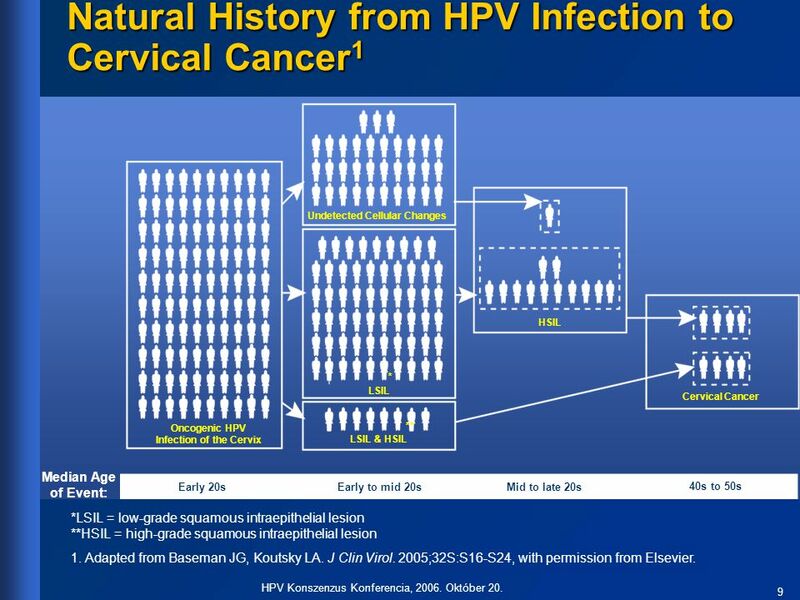 This resulted in a continuous decline in the incidence of invasive cervical cancer from 1990 onwards. In 1995, the incidence was 35% lower than in the mid-1980s.1 Reference 1. Quinn M, Babb P, Jones J, Allen E. Effect of screening on incidence of and mortality from cancer of cervix in England: Evaluation based on routinely collected statistics. BMJ. 1999;318:904–908. 10 20 National call-recall introduced 10 1/Quinn/p. 904 / abstract; p. 905/col 2/¶1; p. 907 col 1/¶2. 1971 1975 1980 1985 1987 1990 1995 Year 1. Quinn M, Babb P, Jones J, Allen E. BMJ. 1999;318:904–908. Adapted with permission from the BMJ Publishing Group. HPV Konszenzus Konferencia, Október 20. 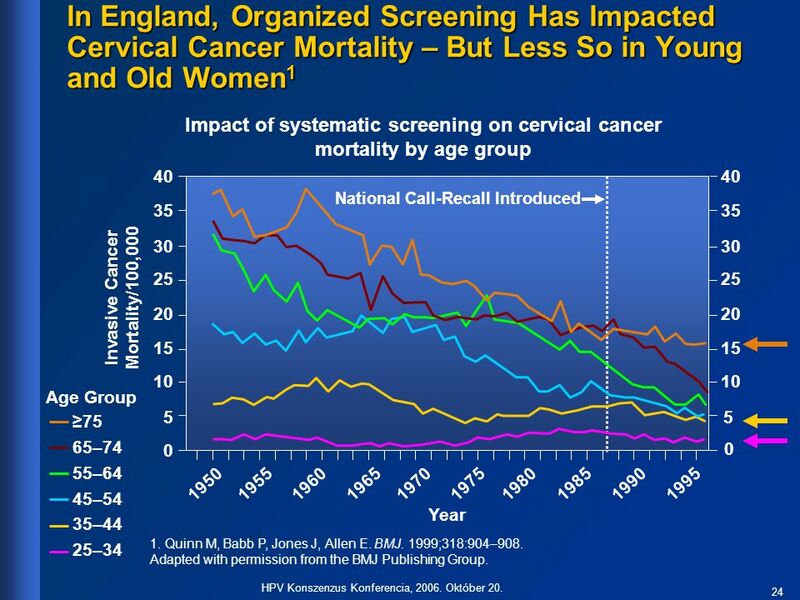 In England, Organized Screening Has Impacted Cervical Cancer Mortality – But Less So in Young and Old Women1 Impact of systematic screening on cervical cancer mortality by age group 40 1975 1950 35 30 25 20 15 10 5 1955 1960 1965 1970 1980 1985 1990 1995 Invasive Cancer Mortality/100,000 National Call-Recall Introduced Year 1/Quinn/p. 906 /Figure 6. Key Point Pap smears are less effective in preventing cervical cancer mortality in younger and older populations. However, mortality in all of the other age groups has decreased. Background This study conducted in England on the impact of the screening program on the incidence and mortality of cervical cancer demonstrated that age-specific cervical cancer mortality has changed to differing degrees in the various age groups.1 In the youngest age group (25–34 years of age), the mortality rate tripled from the mid-1960s to the mid-1980s, and subsequently plateaued. In the older age group, the decrease in cervical cancer mortality was limited after the introduction of the National Health Service (NHS) screening program. Reference 1. Quinn M, Babb P, Jones J, Allen E. Effect of screening on incidence of and mortality from cancer of cervix in England: Evaluation based on routinely collected statistics. BMJ. 1999;318:904–908. Age Group ≥75 65–74 55–64 45–54 35–44 25–34 1/Quinn/p. 904/abstract; p.906/col 1/¶3. 1. Quinn M, Babb P, Jones J, Allen E. BMJ. 1999;318:904–908. Adapted with permission from the BMJ Publishing Group. HPV Konszenzus Konferencia, Október 20. 25 HPV Konszenzus Konferencia, 2006. Október 20. Összegzés A méhnyak rák szűrése: Jelentősen csökkentheti a betegség előfordulását A 35 évesnél fiatalabb és a 60 évesnél idősebb korosztályban a szűrés hatékonysága csekély A diszplázia 25-35, a méhnyak rák éves korban a leggyakoribb. A szűrésen részesülő fiatalok közül minden a citológiai eltéréssel kapcsolatos szorongásnak van kitéve. HPV Konszenzus Konferencia, Október 20. 26 HPV Konszenzus Konferencia, 2006. Október 20. Mindez mibe kerül? HPV Konszenzus Konferencia, Október 20. 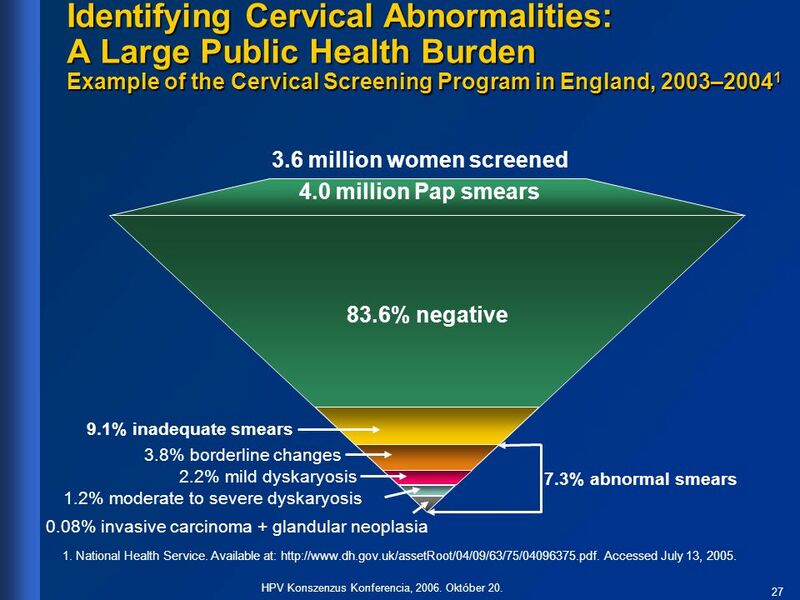 Identifying Cervical Abnormalities: A Large Public Health Burden Example of the Cervical Screening Program in England, 2003–20041 3.6 million women screened 4.0 million Pap smears 1/NHS/p. 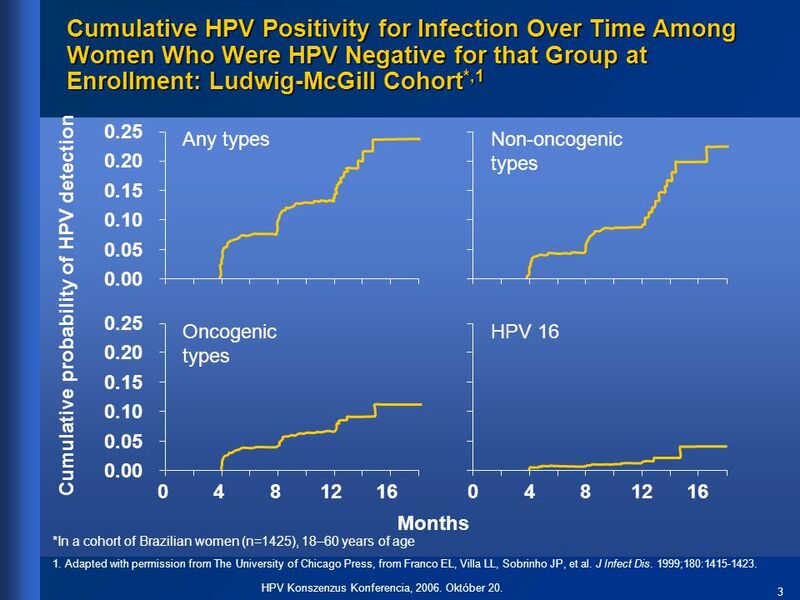 1/¶3; p. 2/Table 7/ calculations 83.6% negative Key Point Although screening programs have obvious benefits, the burden of inadequate Pap smears and the moderate number of cervical abnormalities is still evident. Background In the UK, 2003–2004, 3.6 million women were screened, and laboratories examined an estimated 4.0 million samples.1 Of the ~4 million Pap smears, 83.6% were negative; 9.1% were inadequate (thus women ultimately had to be rescreened); 7.3% were abnormal. Among the abnormal smears, 2.2% were classified as mild dyskaryosis; 1.2% were classified as moderate-to-severe dyskaryosis; and 0.08% were invasive carcinoma or glandular neoplasia.1 The high number of inadequate smears or false-positive results causes stress for the patient and is costly for the healthcare system.2 In England, the annual cost of the screening program is estimated to be £132 million (equivalent to ~$200 million).3 Data from the Population Based Screening Study Amsterdam (POBASCAM) in the Netherlands observed higher levels of cervical abnormalities in their study population. Approximately 2.5% of patients had borderline or mild dyskaryosis; 0.8% of patients had moderate dyskaryosis or worse; and <0.1% of patients had suspected invasive cancer.4 References National Health Service. 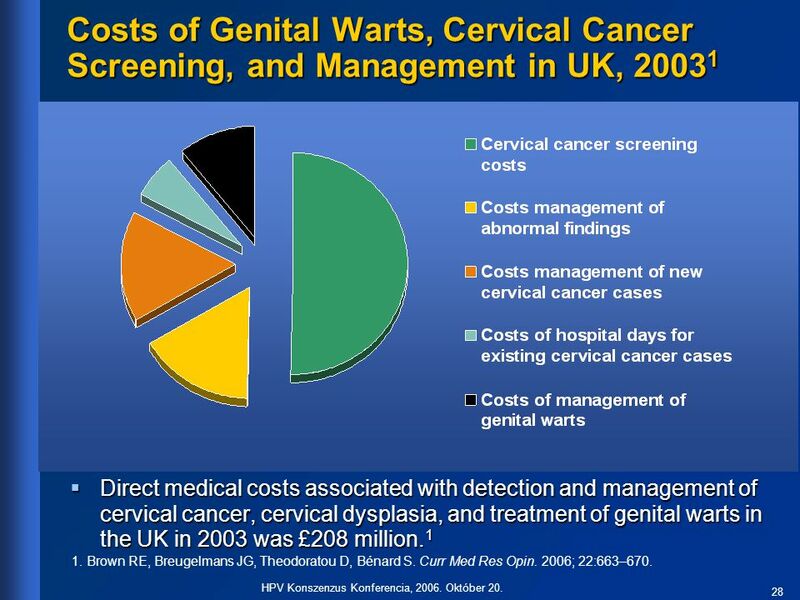 Cervical cancer screening programme, England: 2003–04. Available at: Accessed August 4, 2005. Raffle AE, Alden B, Quinn M, Babb PJ, Brett MT. Outcomes of screening to prevent cancer: Analysis of cumulative incidence of cervical abnormality and modelling of cases and deaths prevented. BMJ. 2003;326:901–905. Quinn M, Babb P, Jones J, Allen E. Effect of screening on incidence of and mortality from cancer of cervix in England: Evaluation based on routinely collected statistics. BMJ. 1999;318:904–908. Bulkmans NW, Rozendaal L, Snijders PJ, et al. POBASCAM, a population-based randomized controlled trial for implementation of high-risk HPV testing in cervical screening: Design, methods and baseline data of 44,102 women. Int J Cancer. 2004;110:94–101. 9.1% inadequate smears 1/NHS/p. 1/¶3; p. 2/ Table 7/ calculations. 2/Raffle/p. 1/ col 1/¶2;p. 3/ col 1/¶5 3.8% borderline changes 2.2% mild dyskaryosis 7.3% abnormal smears 1.2% moderate to severe dyskaryosis 0.08% invasive carcinoma + glandular neoplasia 3/Quinn/p.3/ col 2/¶6. 4/Bulkmans/p. 94/abstract. 1. National Health Service. Available at: Accessed July 13, 2005. HPV Konszenzus Konferencia, Október 20. 28 HPV Konszenzus Konferencia, 2006. Október 20. 29 HPV Konszenzus Konferencia, 2006. Október 20. Összegzés A szűrés és kezelés költsége: Az adatot szolgáltató országok statisztikái jelentősen eltérnek egymástól. Szűrés és kezelés egyaránt jelentős anyagi teher. HPV Konszenzus Konferencia, Október 20. 31 HPV Konszenzus Konferencia, 2006. Október 20. Avegare age of sexual debut1 years Serdülők mivel: a szexuális élet megkezdése előtt szükséges a védettség kialakulása. Minden szexuálisan aktív nő a szexuálisan aktív nők több mit 50%-a megfertőződik HPV-vel élete során.3 a HPV fertőzés nem biztosít teljes védelmet egy későbbi újabb HPV fertőzés ellen.4 2 1. Durex Study, 2004; 2. Adapted from Collins S, Mazloomzadeh S, Winter H, et al. BJOG. 2002;109:96–98, with the permission of the Royal College of Obstetricians and Gynaecologists. 3. World Health Organization. R3232eport of the consultation on human papillomavirus vaccines. Geneva, Switzerland, April 2005.; 4. Carter JJ, Koutsky LA, Hughes JP, et al. J Infect Dis. 2000;181:1911–1999. HPV Konszenzus Konferencia, Október 20. 33 HPV Konszenzus Konferencia, 2006. Október 20. Érvek ….. A méhnyak rák 75%-ért felelőssé tehető HPV 16,18 fertőzés a vaccinával kezelt populációban megelőzhető. A védettség évekig megmarad. A vakcinával kezelt népességben az összes CIN 2/3 eset előfordulása több mint 60%-al csökken a méhnyak rák megbetegedések többsége valószínűleg megelőzhető. HPV Konszenzus Konferencia, Október 20. 34 HPV Konszenzus Konferencia, 2006. Október 20. ….. és kérdőjelek A vakcina rákmegelőző hatását (10 éves korosztály oltása esetén) év múlva igazolhatjuk. A védettség éves fennmaradását még vizsgálni kell. Ha a 16,18-as HPV típusok eltűnnek, előtérbe kerülhetnek egyéb onkogén típusok. A védettség „biztonság tudata” csökkentheti a szűrővizsgálatokon való részvételi hajlandóságot. HPV Konszenzus Konferencia, Október 20. Bár nyitott kérdések miatt a vakcina rák-megelőző hatásáról egyelőre nem tudhatunk mindent, legjobb meggyőződésem szerint bevezetése mellett több érv szól, mint az alkalmazás halogatása mellett. A szűrés hatékonyságának javítása mellett ma Magyarországon ez kiemelten fontos kérdés. HPV Konszenzus Konferencia, Október 20. Letölteni ppt "HPV vakcina a gyakorló nőgyógyász szemével"
A méhnyakrák elleni védőoltás hatékonysága és az eddig megszerzett tapasztalatok Prof. Bánhidy Ferenc Az előadás a GlaxoSmithKline Kft. felkérésére készült. Multilingual websites in Hungary Gabriella Szalóki Egy előadás könnyen vitára ösztönözheti a hallgatóságot. A PowerPoint bemutatók használatával azonban.